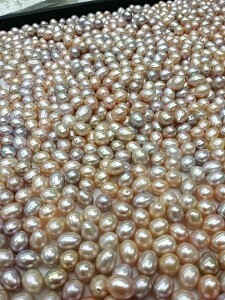 By contrast I also got some amazing white 8mm AAA metallic rounds..classic pearl strands. These are tissue nucleated so the outcome of each farming operation is much more unpredictable. One shell will have up to 32 or even 40 implants. 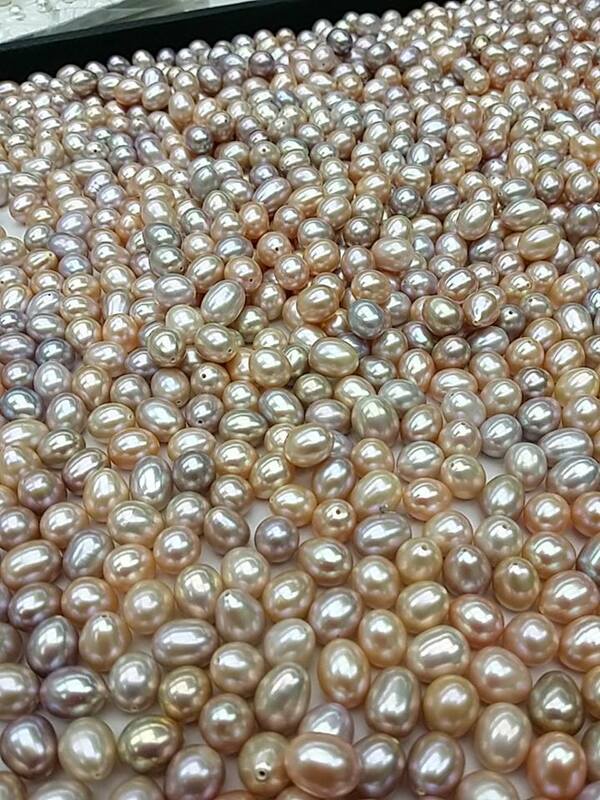 At harvest, after maybe four or five years, a farmer might find himself with 40 completely different pearls..in terms of size, shape and colour. There’s been a huge improvement even since I was last here last September. 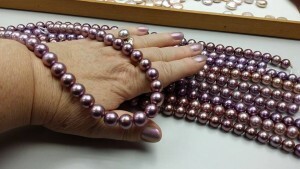 But when we remembered the pearls of five years ago. Metallics wer pretty rare and special then. 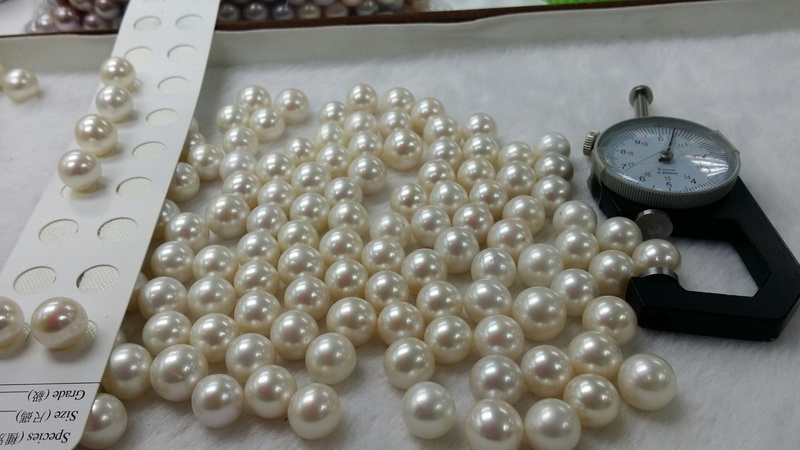 Now I can turn my nose up at anything which isn’t ‘double shiny’ The wonderful, innovative and clever pearl farmers of china need a heartfelt cheer and hereby get it from me. Today’s loot includes the strand draped over my hand, the classic white strands, perfect round pairs and some irregular-ish round-ish pairs in deep natural vibrant colours. Plus some ripples I couldn’t resist. 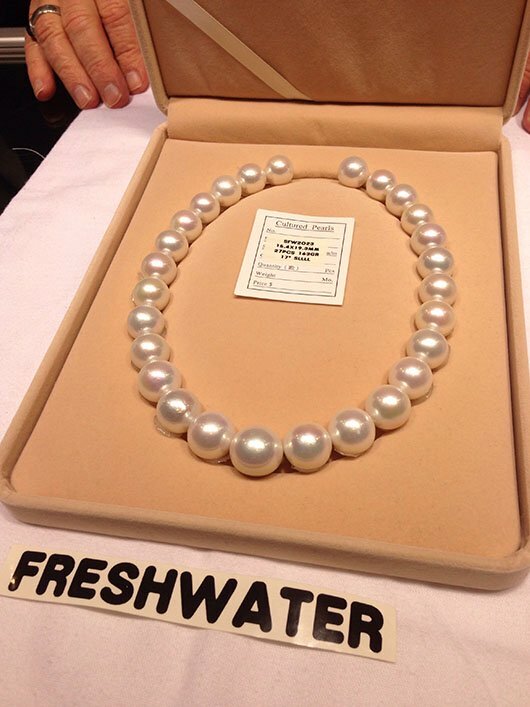 So where will freshwater pearls be in another five years? Given the progress in the last five it’s impossible to predict. But it will be fun finding out. This entry was posted in Pearlescencery on February 27, 2015 by WendyG. What do Hong Kong and Bing Crosby have in common? Well, me and some new fans of the crooner. A mention of the Kowloon district of Ho Hum got me singing the Road to Hong Kong song, which lead to websites, video of Crosby singing and general appreciation of his marvelous voice and an interruption in the pearl selecting. 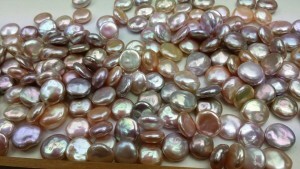 Yesterday was the first day of pearl finding and it went very very well. 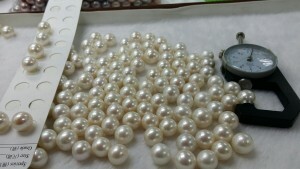 One highlight was finding four pairs of metallic 12mm (yes 12mm) round, smooth metallic white pearls. Stunning all nacre 12mm white metallic AAA rounds white pearls. 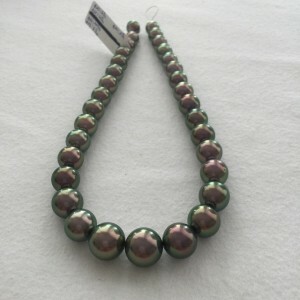 Can you see that some are even more metallic than others? Happily there seem to be more good undrilled and half drilled natural colour and black pearls this time, so I’ve already scooped some.With this many available I didn’t attempt to make pairs, just picked out the shiniest. I can made pairs later. It’s Chinese New Year here, and another highlight was coming across a happy yellow dragon in the street, dancing to a heavy drum beat. No-one seems sure if it is a year of the goat or the ram but happy and prosperous year of the small milk giving mammal with horns to you all! Now I’ve just got to get Ho hum…ho ho ho ho hum ‘ by Crosby out of my head! 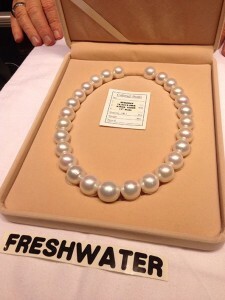 This entry was posted in Pearlescencery and tagged 12mm pearls, hong kong, hong kong gem show on February 27, 2015 by WendyG.